This is the first of 2 posts that will help us dive in and unclutter our tech gadgets and our digital lives. We will address these first five suggestions for a Technology and Digital Declutter this week and be ready next week for 5 more. Spending a few hours a day, over the next 7 day, isn't a daunting task but I think you will immediately appreciate your efforts towards your digital declutter. I do ‘try' to live by that mantra on a daily basis, though sometimes it is easier than others. Right? One area that is often overlooked is the digital clutter on or related to all our many ‘devices'…our phones, our computers, our televisions, our Ipads or Tablets, etc… There are 2 serious areas of clutter related to these devices…1) the cords and accessories that come with the device and 2) all the data and information stored on these devices. 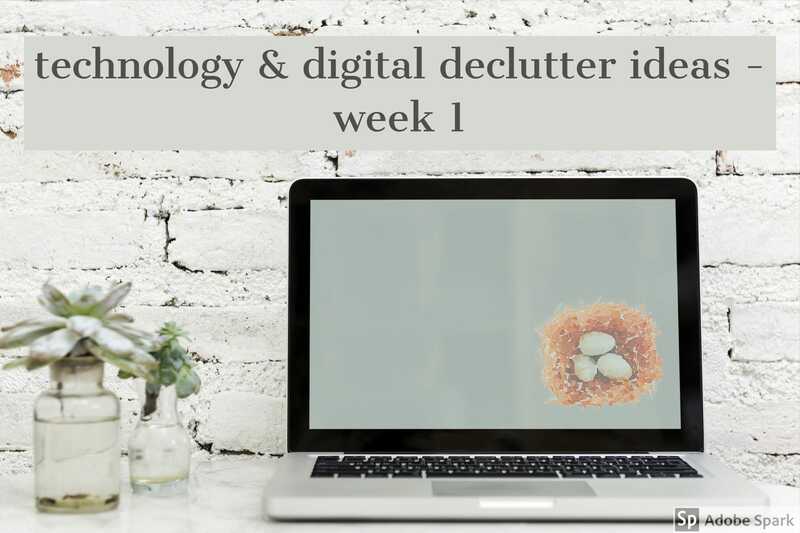 Over the next 2 weeks, I am going to pop in with some suggestions to help us have a successful technology and digital declutter. The goal is that by doing a little technology and digital declutter each day over the next 3 weeks, we will have better control over all the tech and digital clutter at the end of the period. This week, we are tackling cord management, email inbox management, bookmark management, password management and reducing paper clutter via digital means. As it relates to cords, does it drive you a little crazy that every phone has to have its own unique power cord? I mean, my son, my husband and I all have Samsung phones, yet our power cords are all different! Seriously? And then our daughter has her iPhone, which of course has its own power cord. And then there are the cords that connect our phone lines and printer lines to our routers and modems…which of course are identical, but need to be in their ‘special port' or nothing will work. Let's not forget the HDMI cables that our TVs need and the micro-USB cables that are used to connect other compact and mobile devices, like our smartphones, GPS devices, photo printers, and cameras. I have always considered myself a fairly competent person, able to learn what I need to learn. But all this stuff has really been giving me a headache, so I decided to do something about it. The very first step, the step we should take when we bring a device into our home is to label every cord that comes with the device, clearly stating it's usage. I haven't been doing this as I should, which meant that I had to go back and try to figure out what went with what. I ended up recycling a whole bunch of cords (pop over here to see where to take your discards, including those cords for recycling) because I just didn't know what they were for. While I would hate to have to do it, I reasoned that if I really ended up needing a specific cord I could get it. But did I really want a pile of cords sitting around that I had no idea of their use? I use my Brother P-Touch (now discontinued…think this is the new version) to create very specific labels for each cord. For instance, there is no doubt what this cord is for: I folded the laminated adhesive p-touch tape back on itself to create a tag that is not easily removed or destroyed. If I needed to, I could cut the tape off of the cord. 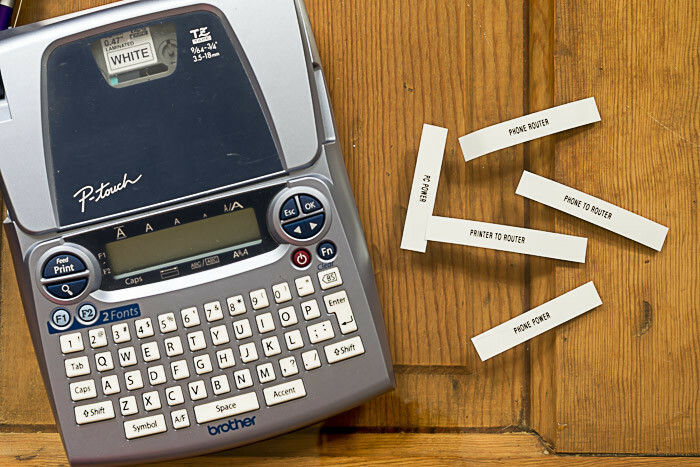 If you have a device, like a router, that connects to more than one other devices (in our case, our router connects to both the printer and the phone) label those specific device cords. Am I the only one that has had to troubleshoot with a phone representative and not sure which cord to unplug? Now, all my phone charging cables are clearly labeled, “Mom Phone Charger”. No one will inadvertently nab it thinking it's theirs and I won't have to sort through my cables trying to figure out which is mine! And don't feel like you need to only label your cords! Label all the accessories that accompany the devices that come in to your home. After labeling all my cords, I also wrapped them in this cable management sleeve to contain and hide them. This neoprene fabric is reversible from black to white and has velcro on either side to form the tube. You can let cords in or out at any point by just opening the velcro enough for the cord. My desk is open underneath and I'm pleased with how my cords are not only labeled but contained and camouflaged a bit. And one other cord management ‘tool' I found…actually, that ended up in my Christmas stocking this year…these Binditz. They are rubbery cord wraps that hang on to your cable, always ready to be wrapped. The bag of 36 comes in 2 different colors (black and white) and 3 different sizes and they are the bomb diggity! I am cord-labeling and cord- wrapping dervish right now. OK, let's talk about Email Inbox Management. Let's see a show of hands, how many of you are in the ‘Inbox Zero' club? How about the Inbox Hundreds Club? What about the Inbox Thousands Club? (oooh me! 🖐🖐🖐🖐). Right, not something to be very proud of and I've been busy whittling it down. I spent a long car ride over the holidays unsubscribing from the many emails that started popping up after doing much of my shopping online. Once you give them your email to confirm your purchase, you are victim to the onslaught of marketing emails. Sadly, there is not a one and done, a one-fell-swoop method of unsubscribing emails. There were some third party apps out there (Unroll.me being one) that did this, but then it was discovered that they were selling the personal data of their subscribers…UGH! So, the safest way to do it is for you to go email by email and unsubscribe. Typically that ‘UNSUBSCRIBE' button is found at the bottom of the page, in the fine print. In addition, fill out this form with the Data and Marketing Association to remove your email address from their roles used by their members. This will only affect email coming from DMA member companies, but every little bit helps. If you find yourself unsubscribing from the same email over and over again, or if a marketing email comes into your box without an option to unsubscribe, forward that email to [email protected], explaining your situation. Sadly, as I mentioned, this is not a task that you will be able to do once and think you are done. Deleting and unsubscribing from emails is a digital declutter that will be an ongoing challenge that you will need to commit to managing on a regular basis. But, I found tackling my email inbox during this digital declutter made my mind feel much lighter. As you go through and delete and unsubscribe from emails, you will surely notice that you receive several ‘types' of emails. If you are in the midst of planning a vacation, you will have emails coming in concerning that trip. If you subscribe to recipe sites, you will surely have some enticing recipes sitting in your inbox. What about items you've ordered online, do you have receipts sitting in your inbox? Create folders for all the different types of emails you receive. Some will be evergreen type folders like ‘recipes' or ‘receipts', but some will be more time-specific accounts, like ‘Trip to Barcelona'. When you get an email associated with those folders, automatically put it in. When the trip is done and you no longer need the information, make sure to delete the folder. This digital declutter will not only help you find what you need when you need it (“Where is that travel itinerary? ), but will also help you to see what emails you don't end up reading at all. Bookmarks are a handy digital declutter tool when you have a website you want to be able to refer back to. The key to an efficient and effective digital declutter is the management of your digital information. Setting up logical folders for your bookmarked pages to reside, just like with your emails, will make the retrieval and management of that information stressless. I primarily use bookmarks to link to the websites for online classes that I am taking. So under my Blog Bookmark, I have a ‘Classes' file. That way, when I need to go to a class, I don't need to remember the website OR if I can't remember the exact name of the class, it's easy to scan the list of classes I am enrolled in. While I use Google Chrome and its bookmark system, I know that bookmarks (or Favorites) are also tools available in Internet Explorer, Firefox and Safari, though each platform has a different way of accessing them. In Google Chrome, click the star on the address bar or the 3 vertical dots on the upper right corner of your screen to access adding or managing your bookmarks. More information here. In Safari, check this guide out for adding and managing your bookmarks. For Firefox, this will walk you through the process. In Internet Explorer, manage your favorites with this process. You could make the argument that you could use Google Docs, Evernote or even your computer document files instead of using bookmarks and you wouldn't be wrong. The key is to find a system that works for you and organize your system in a way that works for you. Essential to a good digital declutter are putting tools in place that make your digital life easier. There are a whole bunch of password managers out there, but the only one I am familiar with is LastPass and I have only good things to say about the program. Not only am I able to have the extension on my PC, but I use the app on my phone as well and it can use my fingerprint on my phone to access all my passwords. It also will identify passwords that you might use too often and can provide alternate passwords for you. It is a true lifesaver to me. It does cost $24 a year, but it is worth every penny to not have to try to remember my passwords or remember to write down the new ones when I have to change them. And while some may feel nervous about their passwords being stored all in one place, I've been using it for years without issue. LastPass is designed to keep sensitive data safe using a zero-knowledge security model in which your password goes through several encryptions. LastPass does not send or store the master password, the theory being if LastPass can access your data neither can hackers. There is no ‘set up' so to speak, you install the extension and once you start logging into your accounts, it will start catching that information. This is not really organizing digital or technology clutter, but rather organizing using digital technology. Despite so much of our data available digitally, we (the collective ‘we‘) still accumulate a great deal of paper on a regular basis. By scanning or downloading important information and organizing it properly, we can greatly reduce the sheer amount of paper in our lives and dramatically reduce the amount of time we spend looking for documentation. I still use the Fujitsu Scan Snap s1100i that I started using 3 years ago. Scan Snap has come out with some new, free software ‘Scan Snap Home‘ that really streamlines the scanning and storing process. Several years ago I set up a file on my computer and scanned or downloaded all the manuals associated with the appliances/equipment we own. While a great idea, in theory, many of those manuals are available online and I might not need to take up valuable space on my computer. Either check with the manufacturer or go to ManualsLib.com for a free download of your manual. The prudent thing to do would be to check to make sure you have digital access to the manuals you need before you toss out your hard copy. For the ones not available digitally, scan your hardcopy before you toss it. But reducing your paper clutter doesn't stop there. Scan your receipts, important communications, school records, invoices, estimates… and put them in appropriate folders on your computer. I have a Home Management Folder in which resides all my manuals, receipts and even hand-written instructions (which I scanned) for technical chores like changing the channel on our router. Under our Healthcare Folder, I keep track of all of our immunizations and test results. While my kids were in school, I kept all the school communications in digital folders with their names on it. Once again, it all comes back to setting up logical folders and sub-folders in your Documents Folder and using them effectively and efficiently. So, that's a good bit to process and put in place over the next 7 days. I hope all these 5 suggestions for a Technology and Digital Declutter are useful and will help you be less stressed and more efficient when you sit at your computer or need to track down a cord for your phone. I'm curious, What are you doing to declutter your digital life? To refer back to these first of 5 suggestion for a Technology and Digital Declutter, bookmark this page (hey…we just talked about that!) or pin the following image.